THE brilliant Marist Brother who taught me Latin while I was in the seminary celebrated his 80th birthday a few years ago. At the party held in his honour there were people from all walks of life – men and women whom Br Roger had met and ministered to over the many years of his religious life, as well as members of his family and childhood friends. One man in particular, having learnt that I and another attending seminarian were present, seemed particularly keen to meet us. It turned out that his enthusiasm and eagerness to make our acquaintance was based largely upon the fact that our presence enabled him to perform his party trick. It began with a story. He had a cousin who was a nun – thus began his tale – and many years ago (this would have been some time in the 1960s from what I could gather) he visited her in the Queensland town within which her convent was situated. Having been given permission to take her out for the day, they had a pleasant drive around the environs, catching up and generally making full use of their limited time together. Having driven back to the convent and sitting in the parked car outside, while exchanging their final goodbyes they noticed a man walking slowly up the street towards them. It transpires this man was a rather well-known tramp from around those parts. The nun in our story – apparently less indefatigable than Audrey Hepburn – was becoming increasingly anxious about what this man might do or say when he reached the car and saw them sitting there – more particularly, what he might say to her, arrayed in full habit. Predictably enough, once the tramp reached the car he poked his head through the open passenger-side window. It would not have been much of a story if he had simply carried on up the street. Then he withdrew his head, and continued on his way. Now comes the party trick. Apparently he does this to every new priest, religious or seminarian that he meets and – more often than not – he is met with the same reaction that his cousin presented when the phrase was trotted out by our passing tramp – baffled silence and a perplexed expression. Our storyteller, having returned his cousin to the convent and driven home, had naturally swotted up on what the phrase could mean and, ever since then, has been enlightening Catholic priests and religious at every available opportunity. The gift of the Son is, I think you will agree, a rather fantastic Christmas present. I was asked by a relative a few years ago – towards the end of December, while people in the background were busy fighting over the last of Nana’s excellent pudding – why we celebrate the birth of Jesus on December 25. After all, the precise, civilly recorded date of the birth of Our Lord is not something that any of the evangelists or apostles were interested in, judging by their written work. When the time came for fixing the feast – finally proclaimed in the fourth century after Christ – the date was chosen for theological reasons, rather than any concern for pernickety details regarding temporal exactitude. I am sure that, by now, we have all heard the conjecture that the Christians of the time simply picked a date that would coincide with some significant pagan feast and thereby assume festivities that were already taking place. The celebrations surrounding the Roman deity Sol Invictus or perhaps a Germanic solstice festival appear the obvious candidates that correspond with this theory. While this seems to hold together as an idea, it lacks all contemporary evidence. The Church Fathers were not even interested in December 25 – they were much more interested in another date which was already of great theological significance at the time. We may celebrate the birth of Our Lord on December 25, but to be born He had to have first been conceived. And we celebrate the Feast of the Annunciation on March 25; exactly nine months before Christmas. So the real question is: why was March 25 chosen as the Feast of the Annunciation, as the moment when Christ was conceived by the Holy Spirit? According to ancient Jewish tradition, God began the work of creation on the twenty-fifth of March – Elul 25, in Hebrew reckoning. If you wish to know how they arrived at this conclusion, I suggest you make a visit to your friendly local Rabbi – the explanation is rather long and complicated and not essential to an understanding of our discussion here. 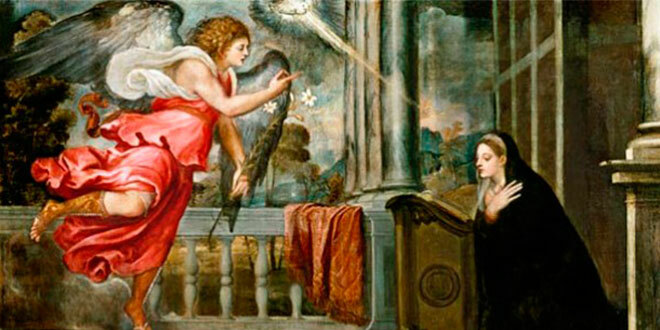 For our purposes it is enough to realise that – accepting that Jewish tradition – the Church Fathers reasoned that if God began the work of creation on March 25, then it would make sense that the Annunciation also occurred on that date. After all, there are clear parallels between the initial act of creation by God and the Blessed Virgin later conceiving His Son by the power of the Holy Spirit. The original creation that had wandered away from God was given a second chance by being presented with the opportunity – the gift – of having all things made anew in Christ. It makes perfect theological sense that this original creation which was begun on March 25 would also be given the opportunity to be re-created anew in Christ from March 25. Once the date of the Annunciation was set as March 25, the date of the Nativity of Our Lord fell on December 25 as a matter of course. This intimate connection between the two events – and between their respective feasts – is even made explicit in the liturgy. At Mass, during the recitation of the creed at the words, “and by the Holy Spirit was incarnate of the Virgin Mary, and became man” we normally make a profound bow, to show our appreciation of the awesome significance of the fact that God condescended to become man. At the feasts of both the Annunciation and Christmas this gesture is made yet more emphatic: the liturgical rubrics make it clear that we are to genuflect at those same words. This ought not to be terribly surprising in light of all that has been said above – I think if we truly comprehended the significance of John 3:16 and those incarnational words of the creed we would have little problem throwing ourselves face-first into the floor each time they are proclaimed. Br Sebastian Condon is from Brisbane. He recently made his first profession of vows with the Dominican order.